Duracase 2.0. 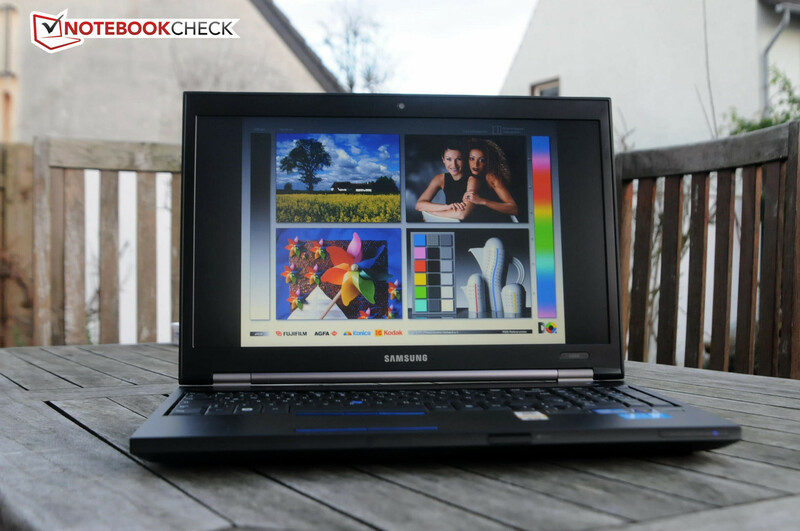 Samsung promises perfect reliability with its business notebook, 600B5B. The 15.6 inch laptop offers a lot of security features and a bright, non-glare screen. Intel's Core i5-2520M (2.5 GHz) and Nvidia's NVS 4200M are responsible for the power. Is the notebook worth its steep price of €1100? Samsung's Series 6 notebook range currently only has two devices. Both 15 inch devices are to bid outstanding perfection and perfect reliability. 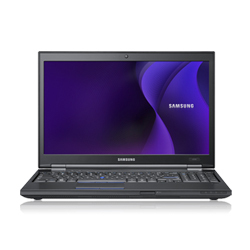 The Samsung 600B2B-S01 is the lower priced model of the two with a price of €1100. It offers the dual core processor, Intel Core i5 2520M with a base clock of 2.5 GHz. NVIDIA's NVS 4200M is installed as the graphics card. 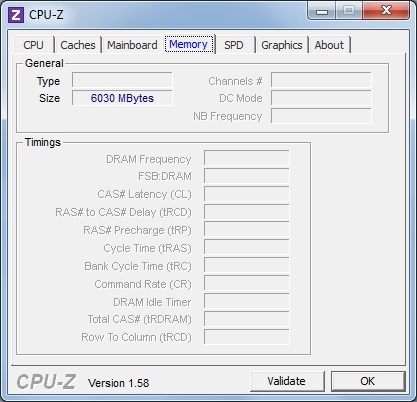 Moreover, there is a 6 GB DDR3 RAM installed on the Intel QM67 chipset. The Samsung 600B5B-HC1 bids more power and more features for just under €1600. A quad core processor, the Intel Core i7-2720QM with a base clock of 2.2 GHz, works inside this model. The 15.6 inch laptop also has a UMTS module and the latest Bluetooth 3.0 available. That's different in the 600B2B-S01, which only sports the outdated Bluetooth 2.1. Both devices are equipped with a non-glare, 15.6 inch screen with a maximum resolution of 1600x900 pixels. The notebook in the Duracase Mg+ chassis has a few security features, for example a TPM chip. We put the Samsung 600B2B-S01 through its paces for you. 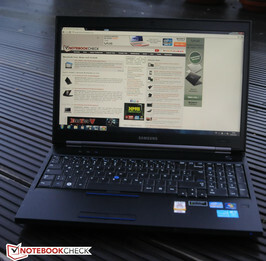 Find out if and for whom the purchase of the €1100 business notebook is worthwhile in the following review. The Samsung 600B2B is definitely no beauty. Its design is basic black, so the Samsung 600B2B isn't an eye-catcher. It's in the eye of the beholder if the design looks boring or professional. Duracase Mg+ is used for the chassis. We previously made sobering experiences with the Duracase material in Samsung's Series 4. However, the addition "Mg+" lets us hope for more. The case is coated with a magnesium alloy and is thus to provide even more protection. In our tests, the Duracase Mg+ chassis proved to be significantly more rigid than the Duracase chassis of the Series 4. In particular, the display lid seems to be considerably stronger. 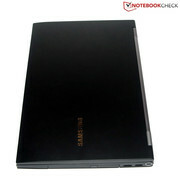 Although the notebook can be depressed selectively at the well-known weak points, the case seems to be more rigid. The screen hinges of the new series also do a much better job than those of the Samsung Series 4. Nevertheless, there is room for improvement. The display lid can hardly be depressed or twisted. A 1.3 megapixel (SVGA) webcam is installed into the display bezel. The owner should easily be able to stow the notebook in the briefcase due to its size. The 15.6 inch laptop doesn't belong to the lightest of its kind with almost 2.7 kg, though. The Samsung 600B2B offers a large scope of connectivity. There are two fast USB 3.0 ports to start with. The manufacturer has also remembered an ExpressCard slot. The modern HDMI port is also worth mentioning. 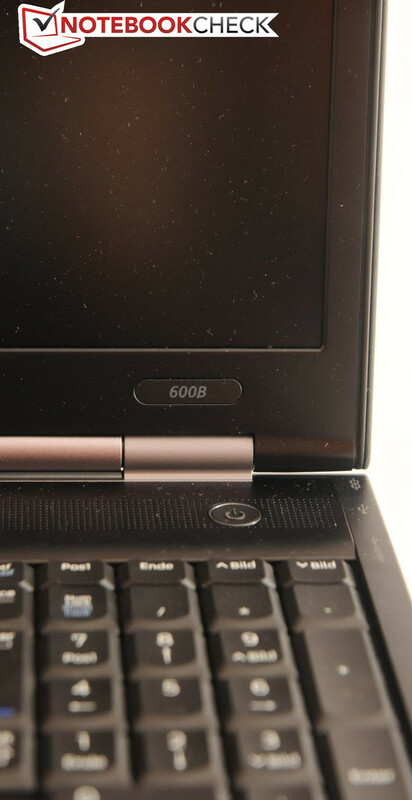 The 15.6 inch notebook has a port for an optionally available docking station on the bottom. The Samsung Smart Dock is available for a steep price of €230. It adds the following ports to the ones already installed: DisplayPort, DVI and serial (Com-Port, RS232, 9 pin). 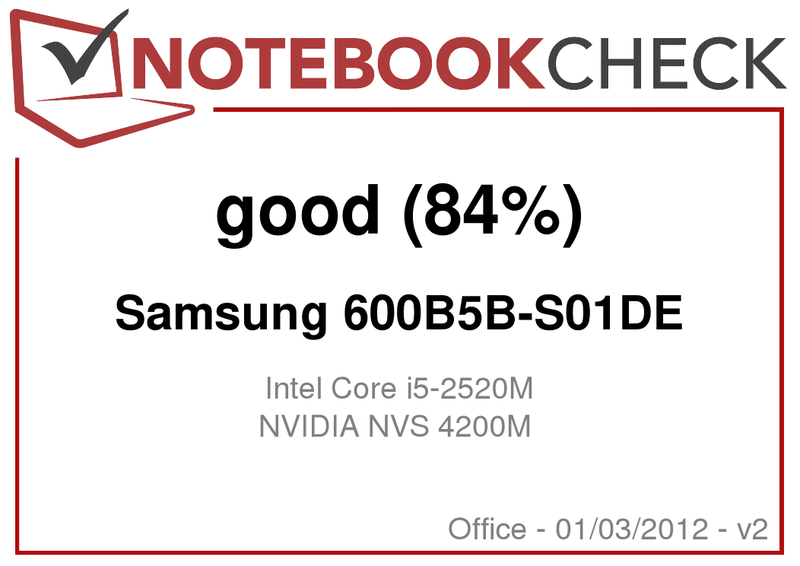 Samsung's 600B2B has the most important communication modules for a business notebook. However, Bluetooth is only built-in as the slow 2.1 version in this model. We also miss a UMTS module in our sample. Many users would find this feature important in a business laptop. Samsung has been generous when it comes to security matters. The 15.6 inch device sports quite a few security features. The fingerprint reader is below the numpad and is to prevent unauthorized access on the system. Moreover, the built-in Trusted Platform Module (TPM) is to provide protection. The hard disk is equipped with a fall protection sensor, which is supposed to prevent data loss in case the notebook falls. A Kensington lock is also present. The scope of delivery is very scanty. Only the notebook and its power adapter besides manuals are in the box. The buyer should be able to expect more for the relatively high price. A small mouse or a protection cover would have been nice, for example. Samsung offers a standard warranty period of 24 months for its Series 6 notebook (incl. onsite pick-up). Beyond that, Samsung also offers warranty extensions. An extension for a period of 12 to 36 months is possible. The surcharge starts at €70 depending on the period and service. The Samsung 600B2B exploits almost the entire width of the notebook for the keyboard. Thus, even a complete numpad has found room, which will especially please users who have to work a lot with numbers. The keys' lettering is white and blue. Only the four arrow keys jut out of the layout a bit. The typing characteristic is consistently good. The keys have a conical cavity that is to increase the accuracy. The pressure point is crisp and the key drop is long. 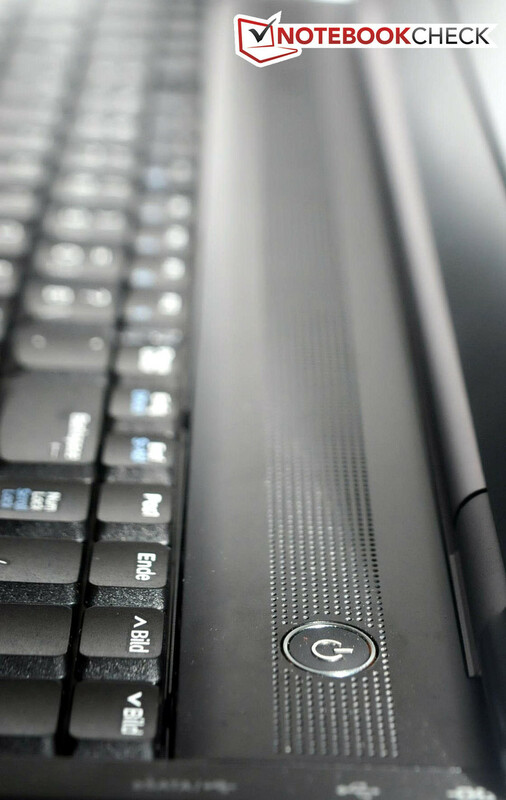 Users who type a lot will be satisfied with the keyboard built into the Samsung 600B2B. Samsung provides the 600B2B user with two alternatives for mouse replacement. The touchpad has a sufficient size. Navigating with the fingers is quite pleasant on the touch-sensitive area. The corresponding key is a bit too soft. When desired, the touchpad can be disabled. As usual, the blue trackpoint is located between the B, G and H keys. The installed 15.6 inch screen convinces to the largest extent in our test. The screen with the model name, 184HT03-001, is non-glare and is thus suitable for outdoor use. The screen manages a maximum, native resolution of 1600x900 pixels (WXGA++) and displays them in a 16:9 aspect ratio. A 1.3 megapixel (SVGA) webcam is installed into the display bezel. External monitors can either be connected via the VGA port or the modern HDMI port. The manufacturer states a brightness of 300 cd/m2. We measured the brightness with the Gossen Mavo Monitor. The 15.6 inch laptop achieves a maximum brightness of 270 cd/m2. We measured an average rate of nearly 253 cd/m2. The Samsung 600B2B is impressive with that. However the brightness is reduced on battery power. While we measured 270 cd/m2 in AC mode, it was only 222 cd/m2 on battery power in the screen's center. 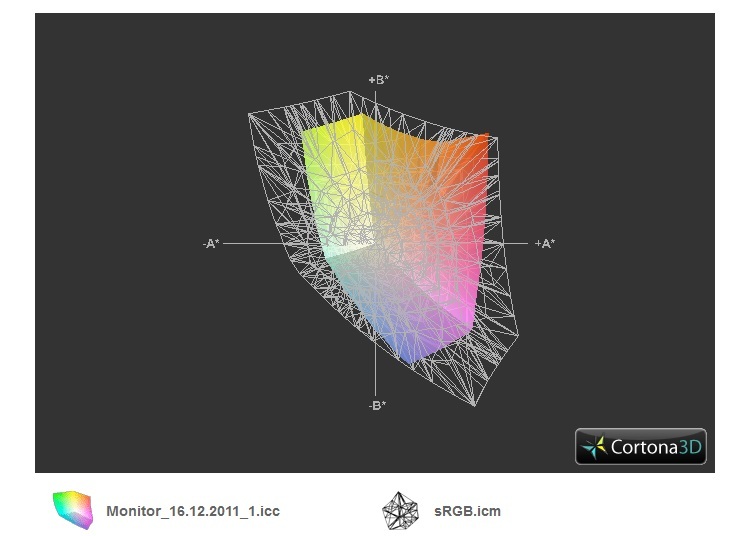 The Samsung 600B5B can't reproduce the sRGB color spectrum sufficiently. The black value that we determined wasn't satisfying either. It is definitely too high with 2.32 cd/m2. This results in an particularly poor contrast of only 116:1. 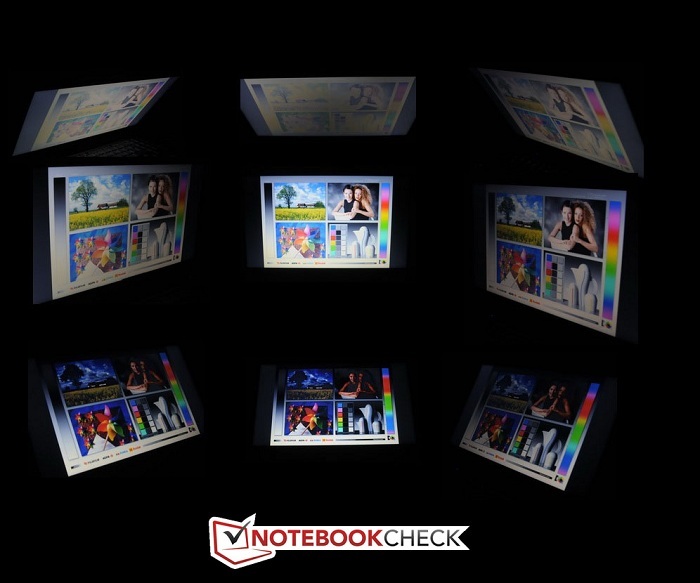 A notebook's screen should be AR coated and have a brightness of at least 230 cd/m2. The Samsung 600B2B meets this requirement. As can be seen well on the picture, working outdoors should be possible. A higher brightness wouldn't hurt, but the notebook has proved its outdoor suitability with that. As so often, the viewing angle stability is restricted. We took pictures of the notebook from different perspectives with the same aperture and shutter speed in a dark room. We used this for the photo montage below. It shows that the screen is fairly stable on the horizontal plane. However, the picture falsifies quiet fast and intensely vertically. The central computing core in the Samsung 600B5B is the Intel dual core processor, Core i5 2520M. 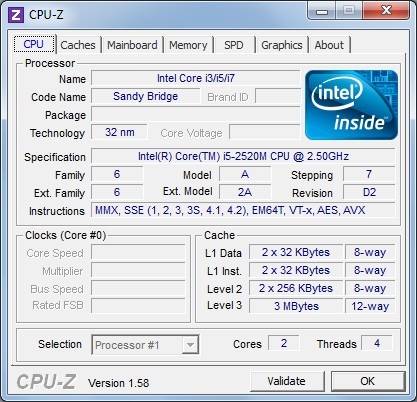 The CPU based on the Sandy Bridge architecture has a base clock of 2.5 GHz. Providing the cooling is sufficient, the clock can be increased to 3 GHz (2 cores) or 3.2 GHz (1 core) for a short time with the Turbo Boost function. Thanks to Hyper Threading, the dual core processor can process four threads at the same time. 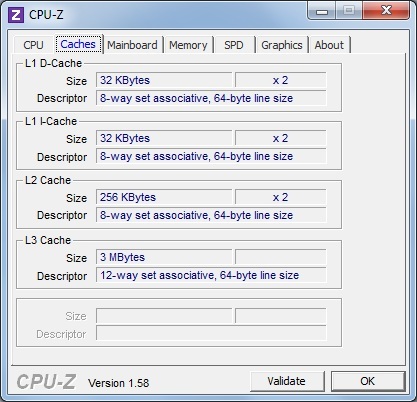 The CPU has 3072 KB available in the level 3 cache, which is particularly important in connection with the integrated GPU. The chip manufacturer specifies a thermal design power (TDP) of 35 watts. The DirectX 10 capable Intel HD Graphics 3000 card is integrated in the processor. It has a low performance level. Samsung has also provided an external graphics card, called NVIDIA NVS 4200M. The business graphics card is based on the same core as the GeForce GT 520M. The DirectX 11 capable graphics card isn't really designed for gaming, though. A lot more focus has been placed on stability and special performance in business applications. Thus, it's no surprise that the graphics card supports OpenCL and Direct Compute. Nvidia's Optimus technology provides longer battery runtimes. It switches between the Intel HD Graphics 3000 card and the Nvidia NVS 4200M depending on requirement. Apart from that, the system bids a 6 GB DDR3 RAM. We took a closer look at the processor's performance with Cinebench R10 and Cinebench R11.5. The Samsung 600B5B manages good 4871 points in Cinebench R10 (64bit) single rendering and is among devices with the same processor. 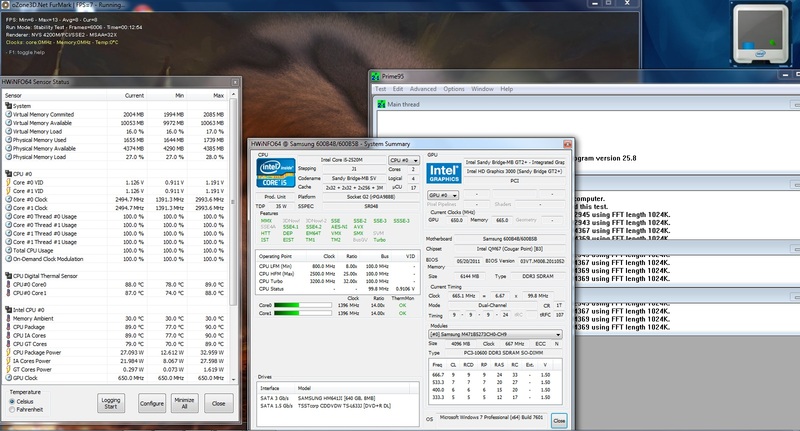 Turbo Boost works well and lets the CPU clock increase between 3 GHz and 3.2 GHz. 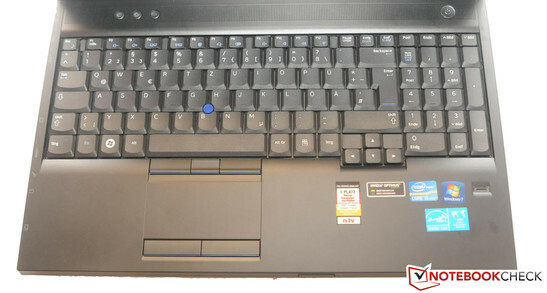 The Toshiba Tecra R840-11E manages 5135 points with the same processor. We achieve a similar result with Cinebench R11.5. 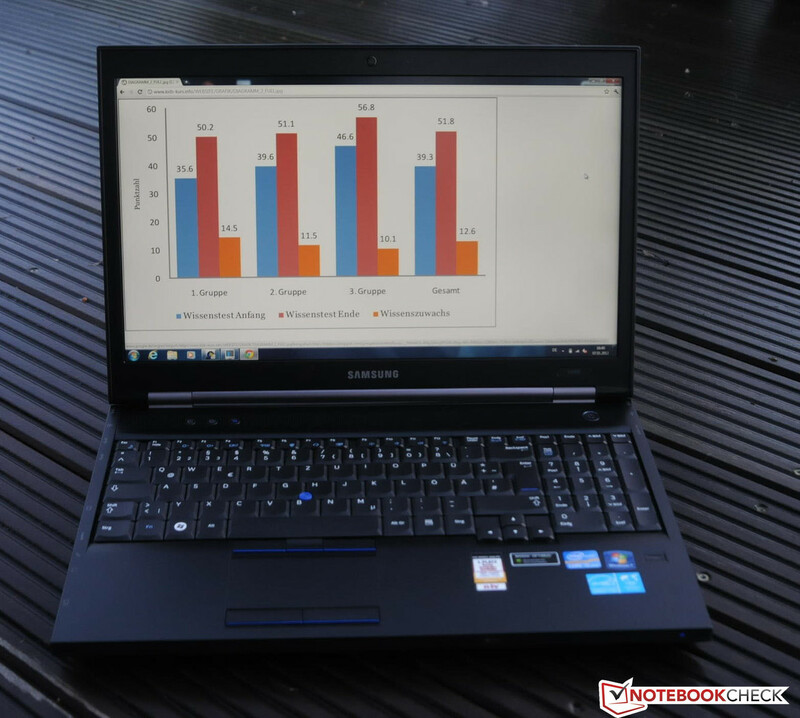 The Samsung notebook achieves 2.84 points in the CPU test. The best model with the same CPU only reaches 0.06 points more. We analyzed the Samsung 600B5B's system performance with the benchmarks, PCMark Vantage and PCMark 7. 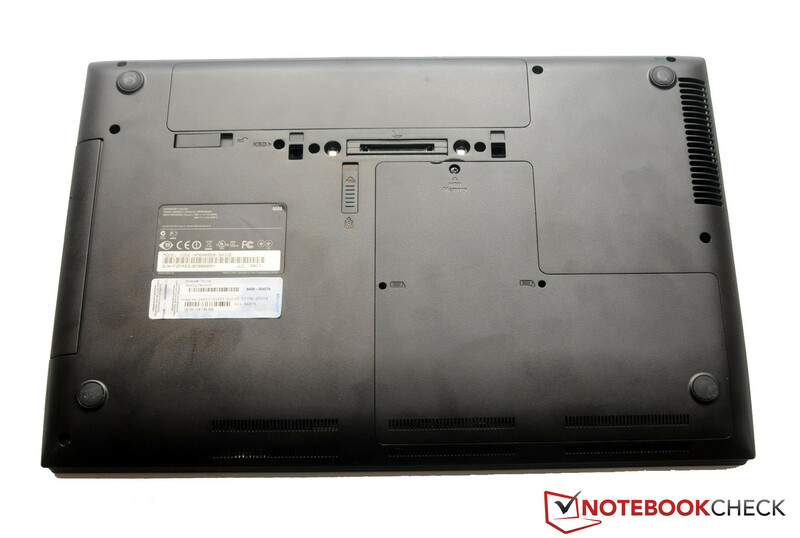 The notebook is in the expected midfield with 6807 points in PCMark Vantage and lines in between laptops with a similar configuration. The same picture results in PCMark 7. The business notebook manages 1908 points here. The built-in hard disk comes from Samsung. The HDD with the model name, HM641JI, has a capacity of 640 GB. The installed hard disk runs with a speed of 5400 rpm. 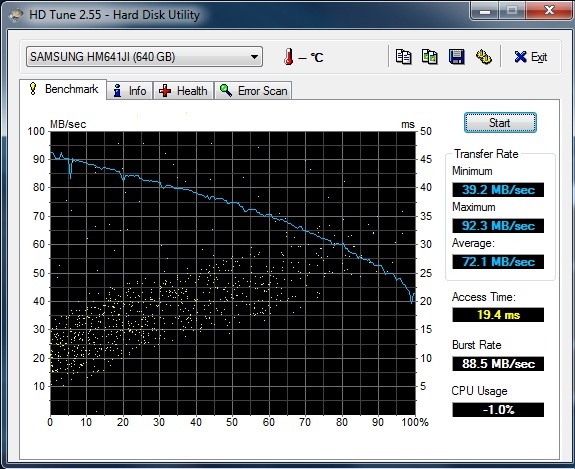 We analyzed the mass memory's performance with HDTune. The HDD manages an average transfer rate of 72.1 MB/s. An SSD wouldn't have only been a lot faster, but everyday use could benefit enormously from the speed increase. As usual, we checked the graphics performance with Futuremark's 3DMark range. The 15.6 inch laptop achieves 5030 points in 3DMark 06, which is a good result compared to other notebooks with the same graphics card. Only the Lenovo ThinkPad T420si manages a better ranking with 5118 points. It's enough for 540 points in the latest 3DMark 11. Thus, the laptop is in the lower third in our benchmark database. Consequently, the notebook is hardly suitable for gaming. Only older games can be played smoothly. Details about that can be found on our detail page of the NVS 4200 graphics card. A quiet surrounding is needed for concentrated work. The Samsung 600B5B is hardly audible in office use. We only measured a maximum of good 33 dB (A). Concentrated work is thus ensured. The 15.6 inch laptop attracts a lot more attention when playing a DVD. We measured 37.5 dB (A) in this case. This rate is still within an acceptable range. The notebook gets even louder during constant load. We determined a peak rate of 44.2 dB (A). This rate is very close to the limit, but will hardly ever, respectively only occur for a short time in office routine. 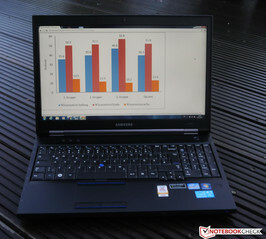 We also looked at the Samsung 600B5B's temperature development. The notebook is not much warmer than its surroundings during low load. We measured a maximum of 25.2°C on the top and 28.9°C on the bottom. That no reason for complaint. We put the system under high load with Prime95 and Furmark for several hours (full CPU and GPU load). The temperatures remained within an acceptable range on the top. We determined a maximum of 33.4°C here. Thus, restrictions shouldn't be expected on the top. However, it looks different on the bottom. The notebook reaches 51°C selectively and 32.1°C on average. We also noticed a slight CPU throttling (1400 MHz) in the stress test, which however was only rare. The clock ran as usual in the subsequent Cinebench R11.5 CPU test, but Turbo Boost wasn't enabled as frequently as in the laptop's cold state. Consequently, only 2.4 points were achieved rather than 2.84 points after the stress test. These observations shouldn't represent a drawback in routine office use, though. Unfortunately, the installed speakers disappointed us greatly. Both loudspeakers have a good volume, but the sound isn't very overwhelming. Both 1.5 watt speakers completely lack bass. This isn't unusual in business notebooks. Our notebook doesn't stand out from its contenders here, either. External loudspeakers can be connected via the 3.5 mm jack. The power consumption that we determined is within the expected range. The Samsung 600B5B consumes a maximum of 13.4 watts in low load. The notebook's consumption increases considerably during load. We measured a peak rate of high 75.9 watts. However, the included 90 watt power adapter can cope with this. We tested the battery life in four different scenarios. First we checked the maximum battery life with the software tool, BatteryEater. For this, we selected the energy savings profile, disabled all communication modules and set the brightness to minimum. The Samsung 600B2B lasted for 6 hours and 32 minutes. Our next surf test is closer to reality. We turned on the WLAN module and increased the brightness to 150 cd/m2. A new website is opened automatically every 40 seconds via a script. The surf fun came to an end after 4 hours and 7 minutes. In another test, we looked at the battery life in DVD rendering. Again, we disabled all communication modules, but we set the brightness to maximum. We could watch a movie for about 2 hours and 44 minutes before we had to reconnect the power adapter. Finally, we analyzed the battery life in load. Here, we enabled all communication modules, set the high performance mode and selected maximum brightness. The BatteryEater software was used again, but this time its Classic test. It was finished after only 88 minutes. Overall, the battery life isn't outstanding, but feasible with about 4 hours in practical use. 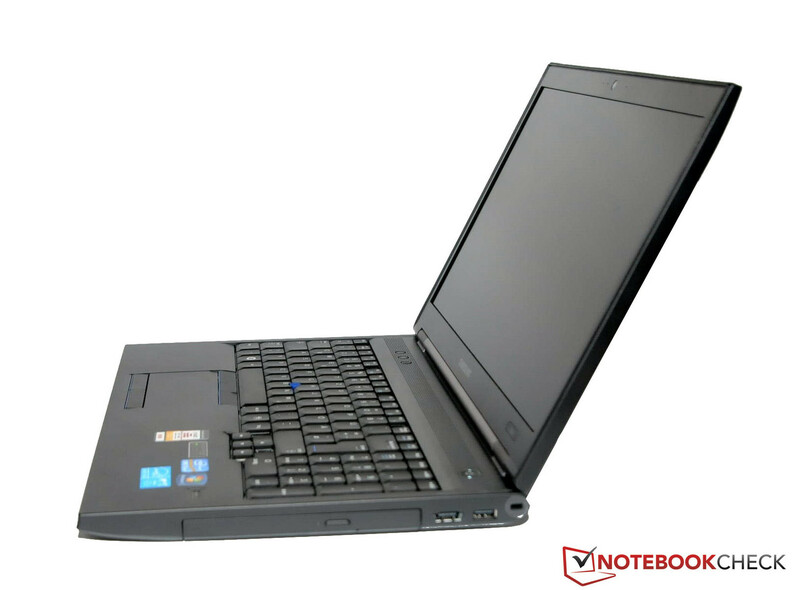 The business notebook 600B5B convinced us in many areas. The magnesium alloy case managed to collect points. 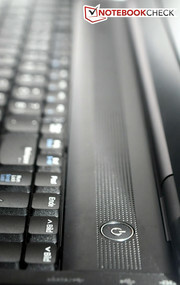 The Intel Core i5 2520M dual core processor (2.5 GHz) and Nvidia's NVS 4200 supply a good amount of power in office use. There are even two fast USB 3.0 ports available. The many security features could also appeal to the business user. Moreover, the 15.6 inch laptop convinces with a bright, non-glare screen, although its contrast is weak. Nevertheless, outdoor use is possible. Those who like the plain design, expect good performance and don't need a UMTS module will get a good business laptop for about €1100. Samsung puts the sister model 600B5B-HC1 on the shelves for higher demands (starts at about €1400, incl. BT 3.0, UMTS and quad CPU). The Samsung 600B5B is available in two versions. The docking station is available for just under €230. The Samsung 600B5B has a complete numpad. The speakers give a weak performance. The 15.6 inch device proved its outdoor suitability. The touchpad's gliding traits are good. The screen's hinges are firm. The case is made of a magnesium alloy. There is a port for a docking station on the bottom. The built-in screen is AR coated. The laptop almost weighs 2.7 kg. 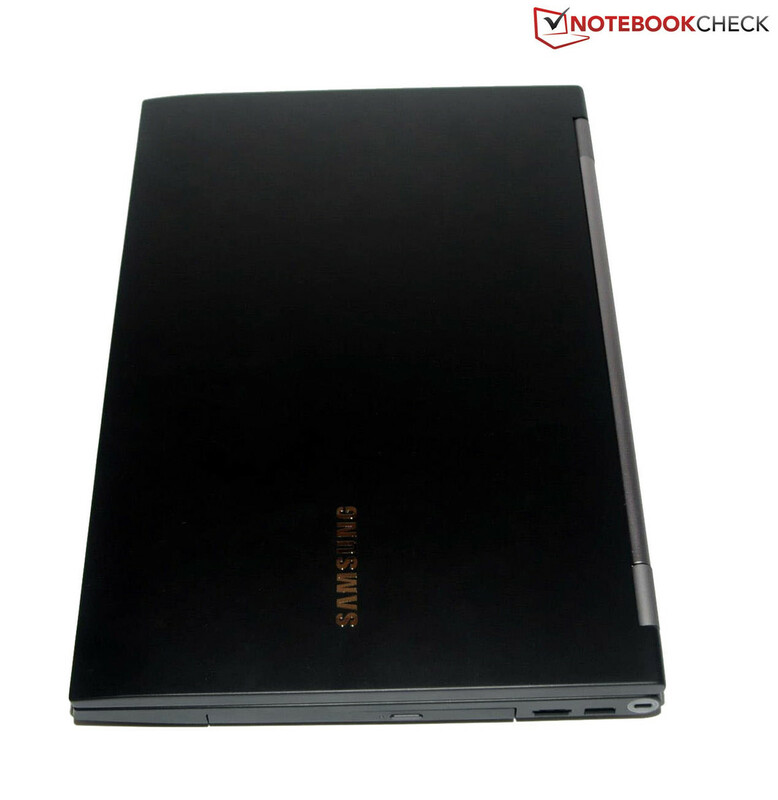 The numerous security features turn the Samsung 600B5B into a real business notebook. The UMTS module like in the more expensive model. The case has a much higher stability than the one in Samsung's Series 4.